Contractor prices for the construction of new non-residential buildings (+1.5%) increased more than prices for new residential buildings (+0.8%) in the third quarter. The rise in the cost of both non-residential and residential building construction was attributable to higher prices for steel and metal products, both affected by the tariffs imposed in June 2018. According to the Industrial Product Price Index, prices for primary ferrous metal products rose 14.3% from January 2018 to September 2018. Increases in contractor prices were observed for all types of new non-residential buildings and in all 11 surveyed census metropolitan areas (CMAs). Prices rose the most in Ottawa (+2.5%), Vancouver (+1.8%) and Montréal (+1.7%). Nationally, contractor prices for the construction of factory buildings and warehouses (+1.9% for both) rose the most. These increases were mainly due to the higher cost of metal fabrication, which is an important component in the construction of both building types. Structural steel products also pushed up the construction costs of factory buildings. At the CMA level, contractor prices for the construction of factory buildings (+3.1%) and warehouses (+3.0%) were the highest in Ottawa, followed by Vancouver and Montréal. Prices for the construction of new non-residential buildings were up 4.3% over the 12-month period ending in the third quarter. 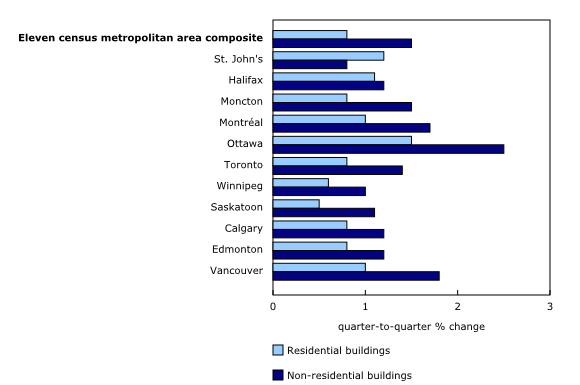 The gain was mostly due to higher construction costs in Ottawa (+6.3%) and Vancouver (+5.8%). Construction costs rose for all types of residential buildings and in all CMAs covered by the survey. The largest gains were in Ottawa (+1.5%), followed by St. John's (+1.2%) and Halifax (+1.1%). The increases were mostly driven by higher prices for the construction of apartment buildings (+0.9%). The largest gain was in Ottawa, where the cost of apartment building construction increased 1.8%, largely due to higher prices for metal fabrication products. Ottawa also led the price gain for the construction of single-detached houses (+1.5%) and townhouses (+1.4%), followed by St. John's and Halifax. Prices charged by contractors for new residential building construction were up 6.0% over the 12-month period ending in the third quarter. Prices rose the most in Winnipeg (+10.2%) and Toronto (+7.2%).